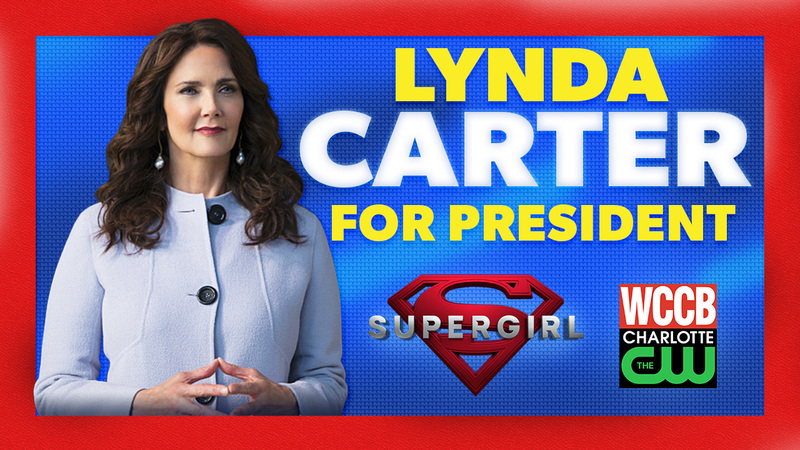 SUPERGIRL CAMPAIGNS FOR CARTER IN CHARLOTTE! Recently Supergirl was seen campaigning in Charlotte on behalf of our Lynda Carter for President grass roots movement. Or at least we were told it was Supergirl. Take a look at the video below for one of Supergirl’s recent Queen City appearances. If you want your own Lynda Carter for President button or bumper sticker, go by Heroes Aren’t Hard to Find (1957 E 7th St) or Rebel Base Comics & Toys (701 S Sharon Amity Rd). They’re free while supplies last. No political candidate in history has the resume of Ms. Carter. In the 1970s, she spent four years as Diana Prince, aka Wonder Woman. No presidential hopeful has ever fought for our freedoms while dressed in satin tights and a star-spangled corset. Armed with Wonder Woman’s “Lasso of Truth”, a weapon that compels people to tell the truth, Ms. Carter would possess an unprecedented advantage in international diplomacy. Now Ms. Carter has been cast as POTUS on The CW series “Supergirl”. Watch the all new season of “Supergirl” Mondays at 8pm on WCCB, Charlotte’s CW. Lynda Carter has not approved this message. In fact, she doesn’t know anything about this.